Happy Thanksgiving to everyone in the US... I hope you all have a great day filled with Family & Friends and maybe a little shopping later on tonight. It's our final day for Right at Home for the Hollydays series. Thank you for joining Nicole and I! 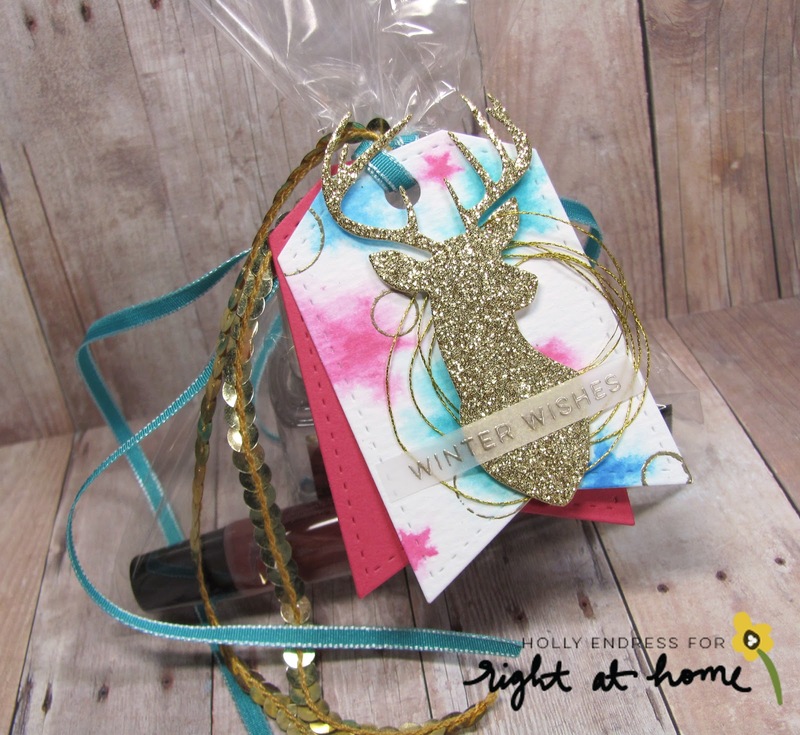 Today I have a cut gift tag that's perfect for any package you may have. I used a cello bag and filled it with some Nail polish and a cute lip balm and tied it up with some Ribbon and Gold Sequins. For the Tag I doe cut a piece of Distress Ink watercolor paper and some Melon Mambo card stock. I stamped the star images from the RAH Christmas Critters set using a few colors of Distress ink and spritzing the stamp before I adhered it to the watercolor paper. On a few of them I spritzed more then others so some were more undefined. Once that was dry I stamped a few of the circles from the Poinsettias set and hear embossed the in Gold. 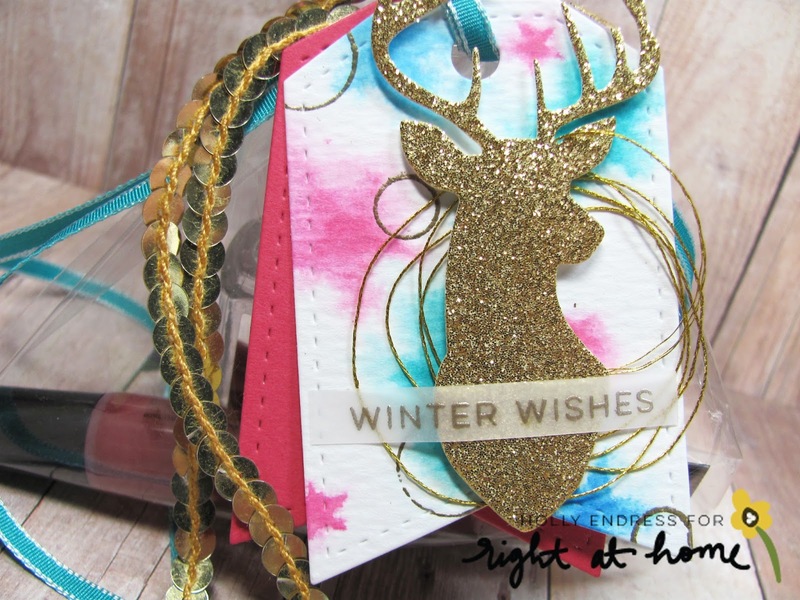 I die cut a stag head from a Sassy Stamps die using some Gold Glitter paper. I added some gold thread behind the stag head and adhered it with dimensional adhesive. I stamped part of one of the sentiments from the Christmas Sentiment set and heat embossed it using some Ranger Platinum embossing powder onto a piece of Vellum. I added a few small dots of Ranger Multi Medium Matte behind the sentiment to adhere the vellum piece. I added the Pink tag behind offset a little and added it to the ribbon on my package. I love creating images with non traditional color for Christmas. Head over to the Right at Home Blog and see what Nicole has created today!